Even though the most recent housing crisis is barely behind us, many distressed homeowners have already moved on and apparently moved in. A new study from credit bureau Experian notes that some 29% of those who sold a house short between 2007 and 2010 subsequently obtained another mortgage. That means despite not making good on mortgage payments on a prior mortgage, they were able to successfully apply for another one just a handful of years later. The waiting period for a new mortgage after short sale can be as short (no pun intended) as no time at all if you can meet certain conditions and apply for a FHA/VA loan. For Fannie and Freddie, the waiting period can be as little as two years, but more often four years. Of course, it’s been nearly a decade since things went south, so many former homeowners have already more than waited things out. And because delinquencies like short sales, foreclosures, and bankruptcies only remain on a credit report for seven years, millions of borrowers are now blemish-free. In fact, Experian says 2.5 million consumers will see these items fall off their credit files between June 2016 and June 2017. Perhaps more importantly, 68% of these consumers are also seeing credit scores in the near-prime or higher credit segments. That means the negative marks are gone and their credit scores are plenty good enough to qualify for new mortgages. 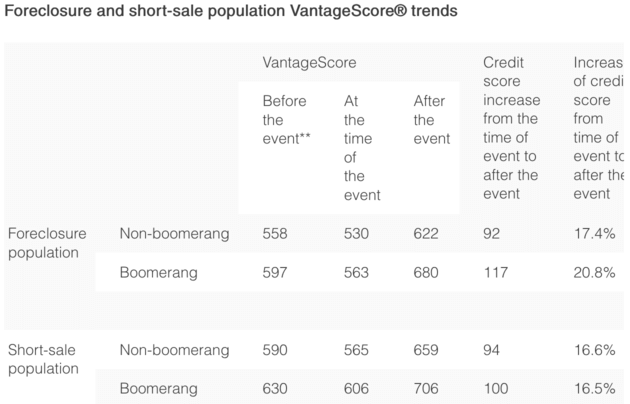 Specifically, consumers with a past short sale that subsequently opened a mortgage had an average credit score of 706, a 16.5% increase from the time of the short sale. So you’re probably wondering how this group of past short sellers is doing on the new mortgage. Well, the good news is they’re doing quite well. In fact, they’re doing better than the rest of the population. Per Experian, only 1.5% of the short-sale group is delinquent (60 days or more past due) on their mortgage, which is well below the national average of 2.8%. Still, for that 1.5%, tsk tsk. Come on. Get it together. Meanwhile, previously foreclosed borrowers are also getting back in the game. More than 12% of those who were previously foreclosed on have boomeranged back into the housing market with a brand new mortgage. And they too are performing well on the new mortgages. These consumers have average credit scores of 680, up 20.8% since the time of foreclosure. 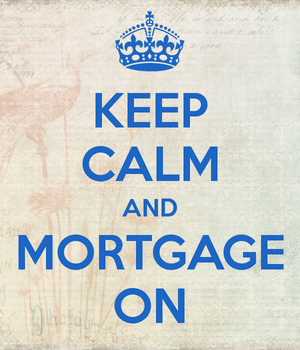 Just 3% are delinquent on the new mortgages, which is just slightly above the national average. I think you can partially thank low mortgage rates for that, along with stellar home price appreciation. Housing is hot and there’s no reason not to pay the mortgage if you can. Underwriting is also a lot better than it was pre-crisis, and most borrowers are making relatively safe loan choices, going with the 30-year fixed instead of an ARM. The good news is that this trend of boomerang buyers should give the housing market another boost, even if we are getting into the later innings. The bad news is that the very same folks who got foreclosed on or were forced to sell short might purchase homes at new market highs. It’s a nasty cycle. 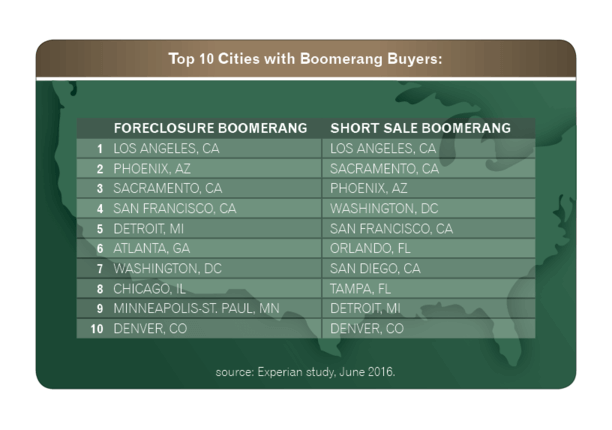 Unsurprisingly, boomerang buyers have been most prevalent in some of the harder-hit areas of the nation including Los Angeles, Phoenix, and Sacramento. But they’re also springing up in places like San Francisco and Denver where bidding wars are the norm and prices are at new all-time highs. So if they can do it, so can you.